Is This a 1.7-Million-Year-Old Man-Made Bridge? 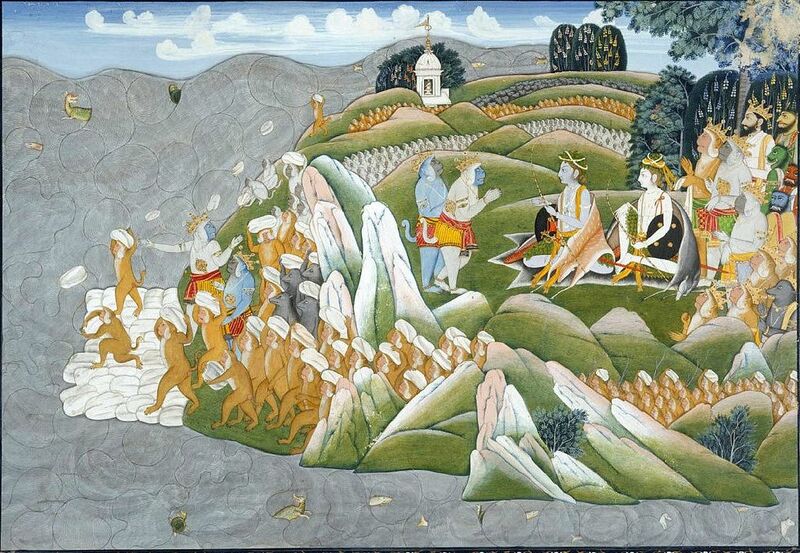 According to ancient Indian legend, King Rama built a bridge between India and Sri Lanka more than a million years ago. Some have looked at NASA satellite images and noted what looks like the remnants of such a bridge. The question is whether it is man-made or a natural formation. 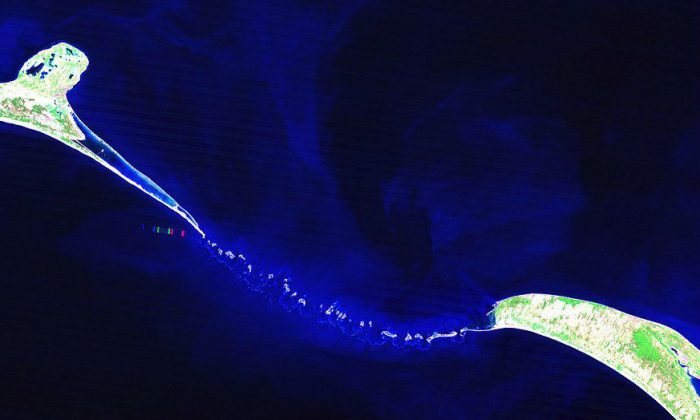 It is known in English as “Adam’s Bridge.” It is often called Rama Setu or Ram Setu in India, named for King Rama. The truth of its origin is buried in political and religious controversy. Some have wanted to destroy the remnants of the bridge to open up a shipping channel. The proposal has been denounced by others as heresy and destruction of an important ancient heritage structure. Dr. Badrinarayanan, former director of the Geological Survey of India and former coordinator of the survey division of the National Institute of Ocean Technology (NIOT) in Chennai, studied core samples from the bridge. He surmised that the boulders must have been artificially placed there. Puzzled by the appearance of boulders on top of a marine sand layer, he surmised that the boulders must have been artificially placed there. The “Ramayana” describes the dimensions of the bridge as 100 yojana in length and 10 yojana in width. One yojana is equivalent to about 5 miles (8 kilometers). This would mean a bridge of astronomical proportions, clearly not fitting the bridge observed there today. Yet, the ratio thus described may fit. The ratio of 10:1 (length:width) fits the actual measurements of the bridge observed today. A group dedicated to a scholarly study of traditional Indian culture from a spiritual background, Bharath Gyan, noted that the ratio of 10:1 (length:width) fits the actual measurements of the bridge observed today. The bridge is about 35 kilometers (21 miles) long, and 3.5 kilometers (2.1 miles) wide. Of course, the bridge as it exists today is not perfectly uniform and the width varies slightly at different points. Although Dr. Badrinarayanan was puzzled by the inter-layering he observed in the core samples, others have explained it in various ways. No single explanation has been agreed upon by geologists. He said that as coral reefs grow upward, they eventually reach more shallow water and are sometimes broken off by waves, thus falling and being deposited below. Sand can similarly be carried and deposited to form various layers over sediments. He thinks that human placement of the boulders is not necessarily the only explanation for the layering observed. In 2007, when fresh NASA images emerged showing Adam’s Bridge and gained traction online, India’s Bharatiya Janata Party (BJP) announced that NASA dated the bridge to 1.7 million years ago. This date fit well with the Indian legends, corresponding to one of the four ages of mankind, the one in which King Rama lived. At the time, NASA spokesman Michael Braukus said he was not aware of carbon dating performed at the site, refuting the BJP claim. Some reports at the time stated that the land at either end of the bridge had been dated as 1.7 million years old, not the bridge itself. 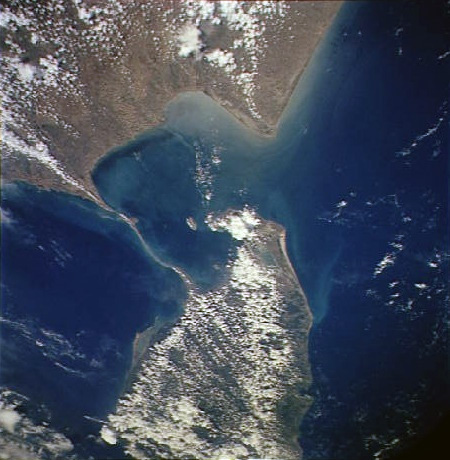 Dating by Indian scientific institutions, including the Centre for Remote Sensing (CRS) of Bharathidasan University, placed the formation of the bridge at about 3,500–5,000 years ago. Dr. Badrinarayanan estimated the range of formation as observed in his core samples at about 5,800 to 4,000 years ago. Critics have said, however, that dating any given part of the bridge (such as coral samples) cannot give a true picture of how old the entire bridge is. In the “Ramayana,” the bridge is said to have been built upon a wooden foundation (which was placed atop a preexisting natural elevation) that was then covered with large and small stones. Those who believe Adam’s Bridge is man-made say that the degeneration of the bridge over the ages has left it in a state that is difficult to discern from a natural formation.